OK! hawks "Kourtney's Body After Baby Exclusive" on its cover--but Kourtney Kardashian says she never spoke to the magazine or posed for the heavily Photoshopped photo. "One of those weeklies got it wrong again...they didn't have an exclusive with me. And I gained 40 pounds while pregs, not 26...But thanks!," she tweeted. As the side-by-side photos show, OK! lopped off Kourtney's stomach and replaced her face with a slimmer one to illustrate her speedy weight loss. "They doctored and Photoshopped my body to make it look like I have already lost all the weight, which I have not," she told WWD. 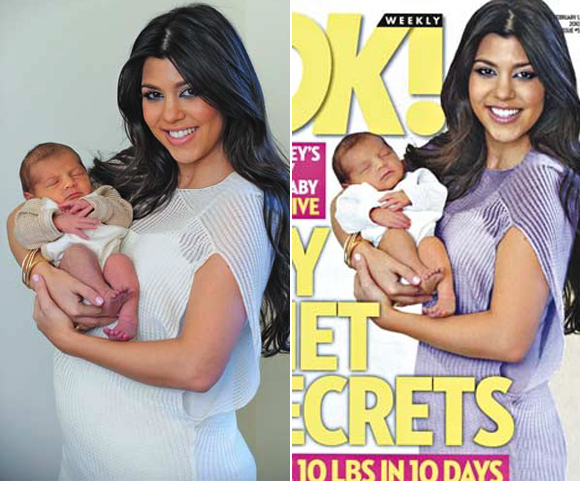 The cover photo was taken just seven days after Mason's December 14 birth and first appeared as part of the January 11 issue of Life & Style, WWD reports. OK! has declined to comment.